Bear in mind that I really love the fluff of 40k and the army variety that exists, the lore, the models and pretty much everything about this game. So with that in mind, please understand that this project was just my way of creating something really fun and I mean no disrespect. So I present to you the story of how I made the ultrasmurfs. So to make this idea a reality I needed a source of smurfs. 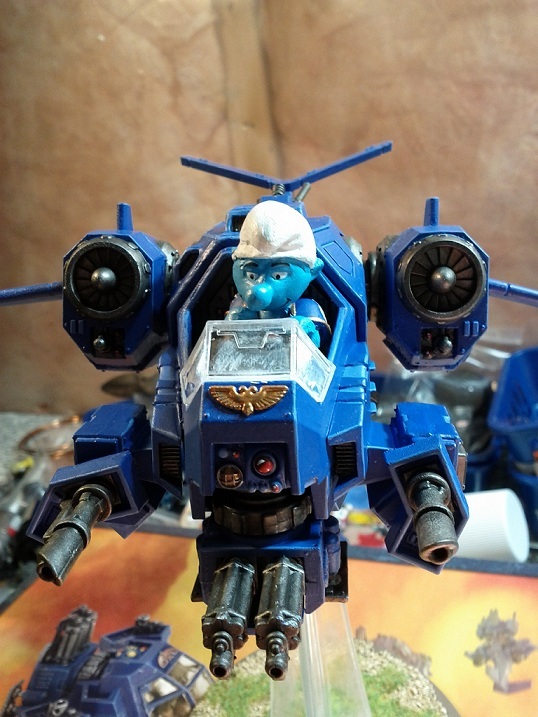 Unfortunately most smurfs are not actually the size of space marines. They are the size of terminators (more on that later). Luckily while walking through Toys R’ Us I saw a vending machine filled with keychains that looked to be about the right size! So a handful of toonies (I’m Canadian – for those not from up here – that’s a $2 coin) later, I had a suitable smurf that could die for the greater good! Our happy little keychain was carved up and cast into legs, torsos, arms and heads. 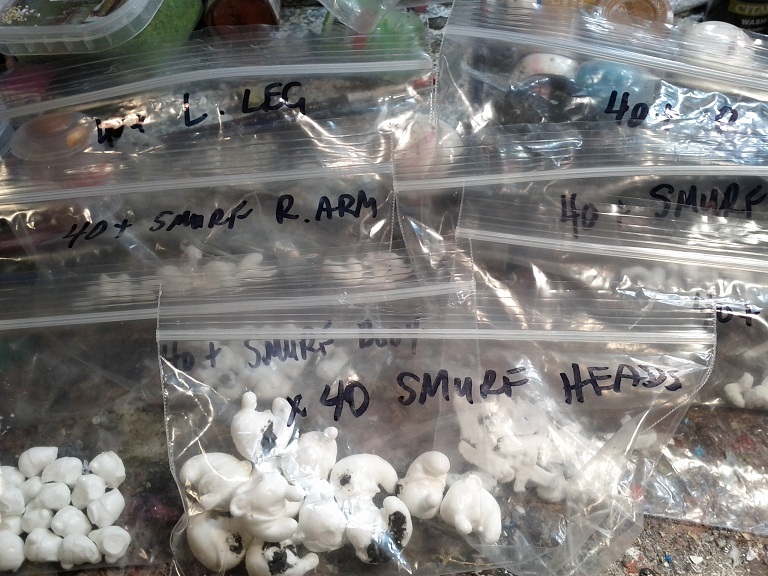 I now had bags of dismembered smurf parts. It’s kind of creepy but mostly satisfying, as I now had the base material to make the vast majority of the army, which would be based around drop pods and tactical marines. Assembly began in earnest, and I eventually had a whole bunch of tacticals made up. I added shoulder pads and bolters so that it would be more obvious what the conversions were, and to satisfy WYSIWYG issues as best I could. 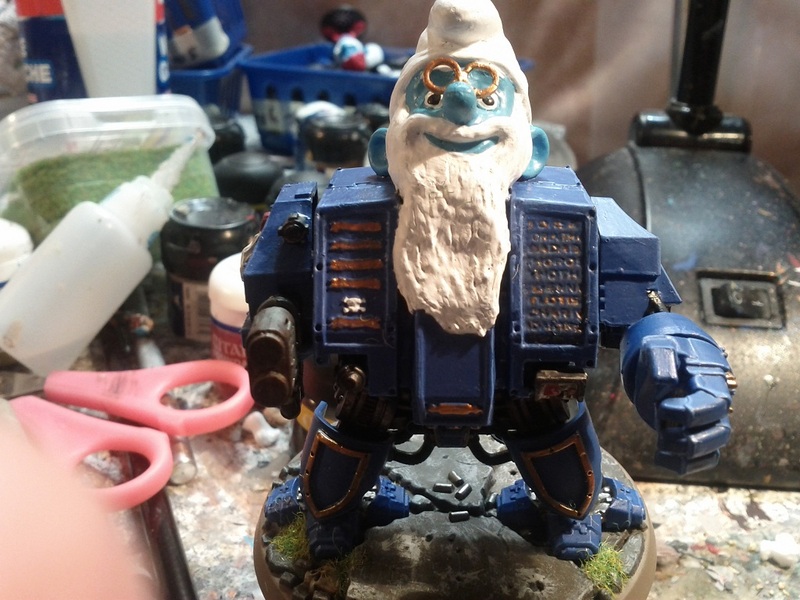 Unfortunately, GW doesn’t make the colour “smurf skin” so I had to approximate as best I could. From a distance, or just with others in the army it isn’t really noticeable, however if you held an actual smurf beside mine, you can tell the colour is slightly off. 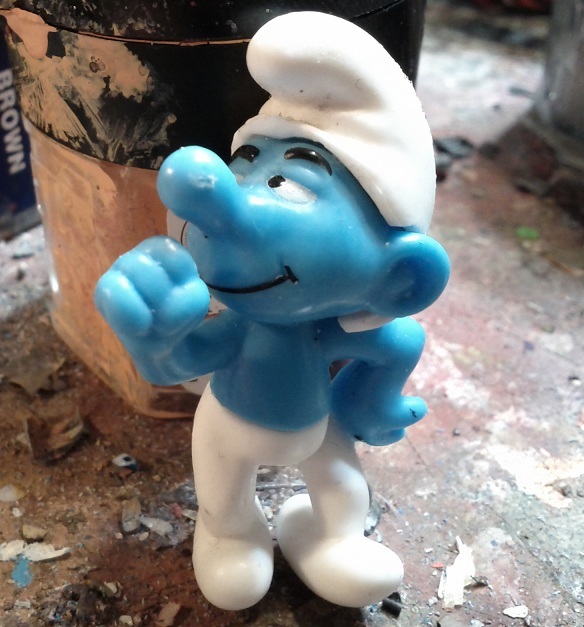 This also meant that any actual smurfs I could find (the previously mentioned keychain machine had a few select smurfs I wanted to use for sergeants) had to be repainted completely or none of the colours would match. 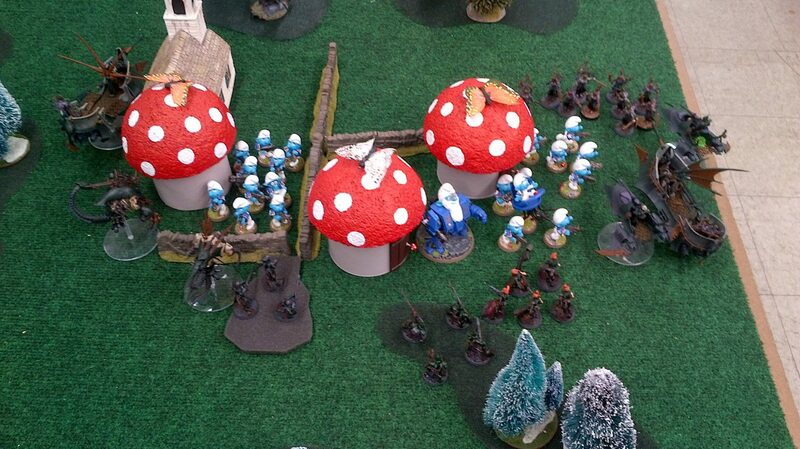 I made small mushrooms for their bases and added some Tyranid bits to illustrate their deadly prowess in battle! Now my tacticals needed some transportation. Drop pods were my go-to at this point. I had to drink a couple bottles of scotch to get all the cardboard tubes I needed (purely for artistic reasons of course!) but that combined with some Styrofoam balls cut in half, and some balsa wood for the doors gave me my drop pods. 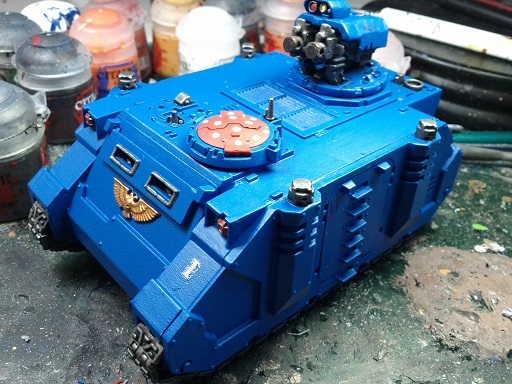 I couldn’t really just have tactical marines in drop pods and call it an army. I needed something more. 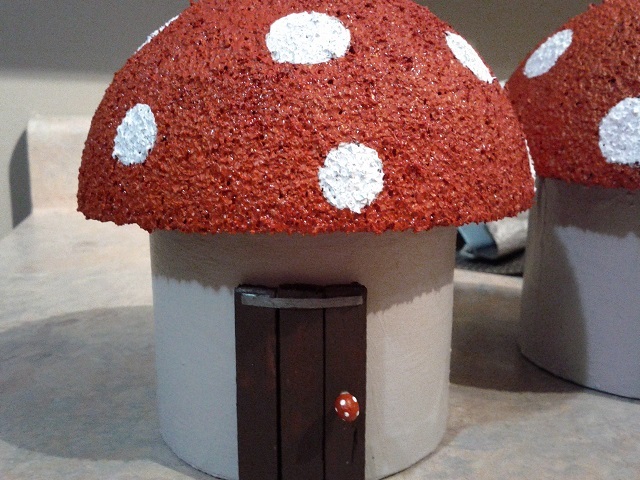 Well grandpa smurf’s body just isn’t so smurfy anymore, so he needs to be entombed in a smurfnought to keep him smurfy. Luckily since smurf is a verb, noun and adjective, this makes fluff easy! However, it’s also super annoying so this is going to be the first and last time I do this during this article. I promise. So I had made some terminator attempts that just didn’t work at all. The scale was slightly off and they seemed just way out of proportion with their little smurf buddies. My son (in all his helpfulness) suggested that Chapters had all kinds of smurfs in stock, so my very patient wife tells me to go buy the smurfs I need and she’ll give them for me for xmas. As my son told me there were smurfs in little lobster/crab suits I had already visions of my “twin lobster claws” smurfinators, and already thought to change my list to accommodate them, so I hurried off to Chapters. 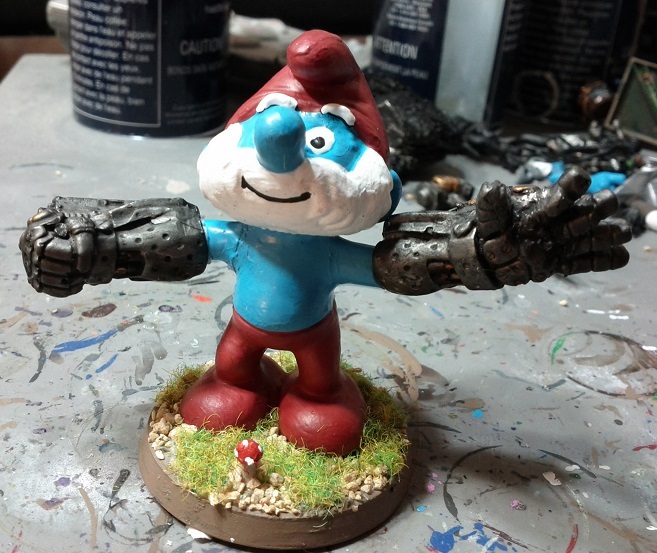 Once there I found a ton of smurfs all the appropriate size for terminators – slightly larger than my bolter smurfs but not nearly the size / proportion of the ones I was going to use. I grabbed 10 terminator equivalents, a poppa smurf to be Marneus Calgar (with Cygnar warjack arms for power fists) and smurfette for my librarian. Then the very nice cashier handed me my wrapped present and announced my total … $80.68…. for 12 little smurfs! Note to self. Should have bought actual terminators. Luckily for me, my very patient wife merely laughed at my story. Although at this point in the project I’m pretty sure she’s convinced I’m nuts. 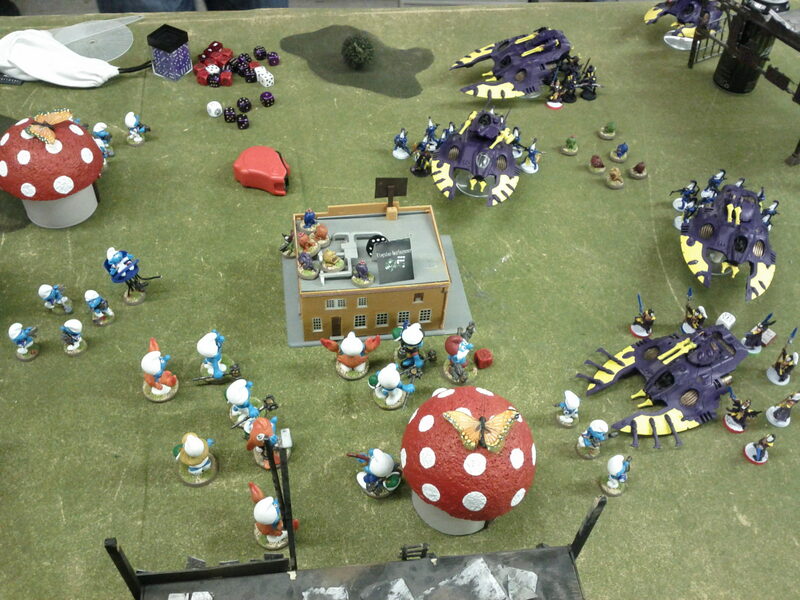 Now that things had come together with the army I was able to play a few games and get a feel for how it played. Generally it worked out pretty good for casual games as massed tactical marines and objective secured drop pods everywhere was great for objective games. I made sure that, as with any “counts as” army that my opponent was okay with playing against it first and that everything was clear as to what it was. I had initially wanted to bring the army to a very casual tourney, however was told it was not welcome. This was my first brush of how a “joke army” can cause some real upset to people. As I had only built this with fun intentions, I certainly didn’t want to offend anyone so made sure that any time I wanted to bring the army anywhere that wasn’t local to check with tourney organizers to ensure it was okay. 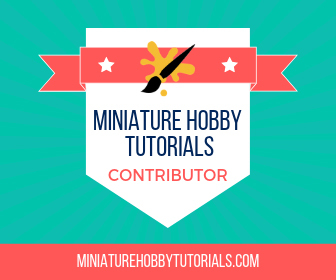 The army was featured on a few different sites including a battle report on Skaredcast and a feature battle report on miniwargaming. This exposure of the army online also had pictures cross linked to other sites. Soon it became clear that my “fun” army was a joke that some people got and were okay with, but other people were offended by. I received some negative feedback that accused me of just gluing bolters to toys and stomping all over peoples’ beloved fluff. This was certainly not my intent, but it led to an important lesson. When you make a “joke” army you are opening the door for not only laughs, but also some real genuine upset. So if you too have some idea in your head that seems pretty fun and offbeat, I’d say go for it. Just be prepared to be sensitive to the experience of others you may be matched up with. The joke army should be the fun exception to the rule, not something to be forced upon your opponent when that is not the experience they are seeking. 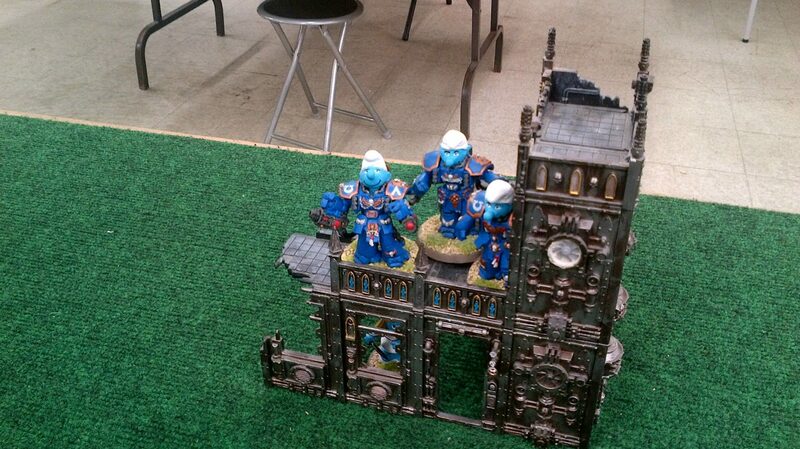 Oh, and smurf battle company is in the works of course. Just because it’s a bad idea, doesn’t mean I need to stop right? If that wasn’t enough for you, check out my Star Wars themed 40K army next. I think this is awesome. I would have absolutely no problem playing against this. Only people who take themselves too seriously would take issue with it. It’s meant to be comical, and it’s pulled off well, so I salute you! thanks! locally they’re very well accepted, and no one’s ever really had a problem with them. Online is another story however! HAHAHA I was rolling as I saw so many of your crazy conversions, and $80 for Smurfinators? Ridiculous! thanks! yeah I definitely learnt a good lesson on that one! So… wow! This has been a thought provoking post for me. That is to say that the thought was around why people like/love/dislike/hate what people create. My personal belief (after some deeper thought) is that we all should avoid “hate” at someones creation but rather try to describe how the creation makes us feel. That aligns well with the artistic concepts of engendering an emotional response. In other words, save “hate” for nasty real life stuff (may you all never experience that level of nastiness). Philosophical comment: Check! So on to how this makes me feel… Happy of course and with more than a few giggles along the way while reading your post. I really enjoy your work and I realise why: you have tried to keep the theme with some practical applications such as scale and your execution is better than some circa 1980s models. 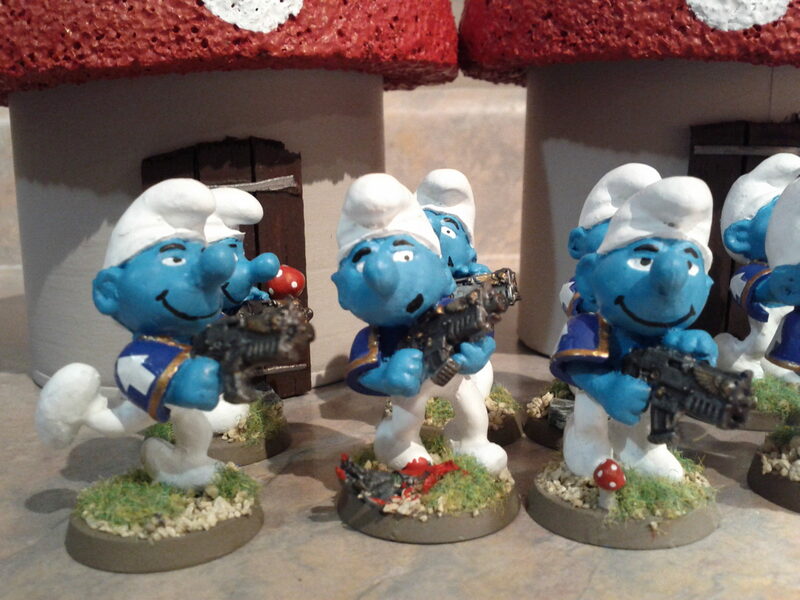 The Ultrasmurfs look like they are holding their bolters correctly and keeping up that happy go lucky “la-di-da, la-di-da-daa” feel. NICELY DONE. I know I’ve seen some negative comments on this Army around the interwebs, but I’ve always thought it was awesome. Great to get to hear the story behind it. Thanks! Thanks! yeah it’s not always well received, which is part of why I wanted to write the article, to give more of a story behind it. Your army is beautiful and a bit creepy!!! Well I think that you are doing something like “a great bath of reality” so people can be angry ( as always reality is shown): in the end, space marines etc. are simply pieces of plastic that we give them a certain meaning/value, but they are not different from smurfs. I think that in a game like our a person should do everything wants, above all if the work is cool like your! The puns, dear Tzeentch the puns! Great army and great post! 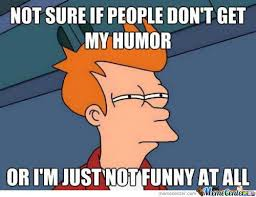 After writing some humour articles online myself, I can confirm that not everyone gets the joke online! totally true – but at least in person people have generally been super friendly about it!